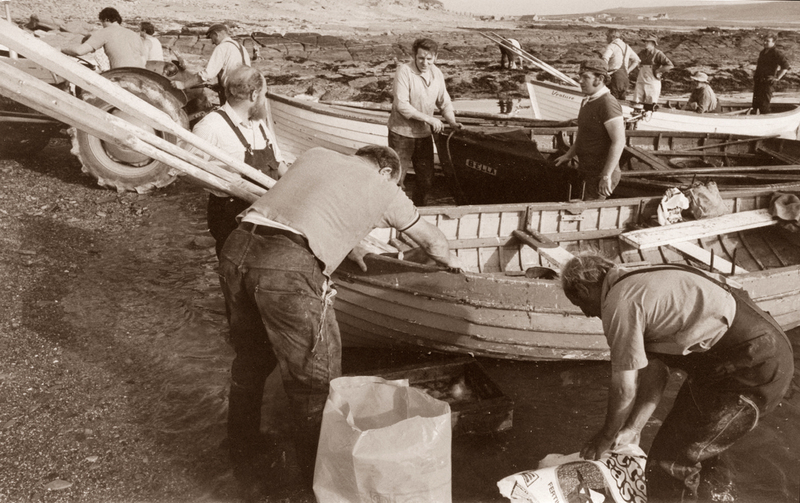 Haddock fishermen in Castra Geo Birsay (1976). Can you name them all? In the days when Birsay caught haddock was king. At least half of the men on the beach then are no longer with us. I'm going to have a go at naming some. Nearest to camera Barr the man near right. Maurice Garson, Billy Sabiston, Norman Stevenson, Harry Sabiston. I might be totally wrong. Great picture though. Maurice Garson and Billie Sabiston of Midhouse are indeed at the front. The man on the near right is Sandy Comloquoy, my father. In the middle distance at the prow of the "Bella" is Freddie Breck with Benny Norquoy to his right. The man behind the tractor is Doddie Coghill. The boat at the back is the "Venture" which I think was owned by Jackie Meadows of Gairsty in Marwick. I can't positively identify any of the crew.